Thank you for simplifying the set up process for sales tax. Most of my sales take place in Los Angeles and Orange County, CA. Where can I find out whether I am dealing with multiple jurisdictions and need to set up a group sales tax like you described in your example for Davis? Sue: That does depend on many factors, such as where YOUR business is located, what kinds of items or services you are selling, how you are selling, and more. If you are located in California, you should have a state resale number, and the Board of Equalization can provide you with information about tax districts. You can also talk to a local CPA to get assistance with understanding sales tax. In California it can be very complicated. My business is located in California, but for most of my income I don’t have to charge sales tax because of the method I use to sell and deliver products. It can be quite complicated. Start by looking at the information from the Board of Equalization. Is there any way to set a cap on the amount that is taxed? In FL we have a surtax in some counties that is only taxable on the first $5,000.00 of sales. Michelle: I don’t have a really good answer for you. Sales tax items & groups don’t have a way to set a limit. What comes to mind is a workaround that isn’t perfect – and please note that I haven’t tried this. Unfortunately, this won’t set up your sales tax liability report correctly. Add an item to the item list of type “other charge” for your county surtax. Leave the amount set to zero. Have it post to an “other current liability” account for “county tax liability”. If you have multiple counties you have to set up an “other charge” item and “other current liability” account for each county. You will not include the county tax in any sales tax groups. In your invoice you will enter the taxable items with a taxable status. 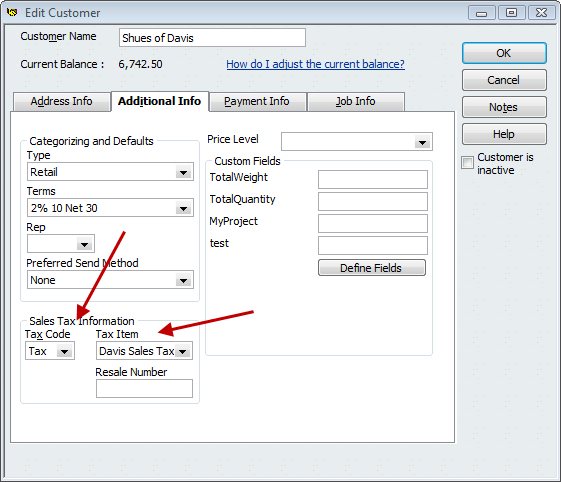 You will manually calculate the county tax amount, add the “other charge” item, enter the calculated tax in that item. Make sure that this item is set as non taxable. This tax amount will be posted to the liability account. You now have an amount accruing that youwill pay to the county agency. Because the County Tax is not a true sales tax in QuickBooks, it will not be tracked in the sales tax liability report. You will have to look at this amount in your balance sheet. That is what comes to mind, if I think of something else I will post a comment here. I think the report is confused by having all the taxes being paid to one vendor but I’m not sure so I thought I’d ask. Chad: Without seeing the actual report, and how you are using the program, I can’t give you a specific response. However, from what you are saying, it sounds like you have it right, or at least close. Every state has different reporting requirements, and I’m not familiar with what you need in Minnesota. In California, where we have different tax districts, all are payable to the same “vendor”. However, on the reports we provide them, we have to break out each separate kind of tax. That is what you are seeing – a value for each of the separate taxes, so you know what you have to report for each separately. I will be talking about the sales tax liability report in more detail in a future post (possibly in a couple of weeks). Charlie: I recently started to work for a small business in California (Orange County) that uses QuickBooks, and unfortunately the former office manager was not familiar with QB. She set up the sales tax items to be paid to the Franchise Tax Board rather that the Board of Equalization. Is there anyway that I can change the tax agency name in QB? Or do I need to set them all up again using the correct agency and set the incorrect ones as inactive? Or can I merge the two, Set up the Board of Equalization as a vendor and merge the farancise tax board vendor listing to it? Any help would be greatly appreciated! Teri, you can just change the vendor that you are using in the sales tax items in the item list. That should take care of it. Don’t merge, just add the new vendor in the vendor list, then change the sales tax items to point to the new vendor. Make a backup copy before you try this, print the sales tax liability report, make the changes, look at the same report and you should see that they match, other than the vendor that is shown. If I buy 100 bottled water coolers for resale, then decide to add 80 to inventory and put twenty into the rental fleet to produce rental income, then I must pay the sales tax on those twenty. Is there a way to flag these twenty coolers so that when I pull up my sales tax liability report, they are included and tax is calculated? We do this with several inventory items, not just coolers, and it becomes tedious trying to keep up with all that we need to pay tax on. Collette: I can’t give you a complete answer in a short comment here. I don’t know what your state requirements are for reporting. And, to be honest, I haven’t worked directly with a client with this situation. Off the top of my head, sales tax isn’t going to work for you because it is applied to the entire invoice. I would set up an “other charge” item for each of your taxes, set to “non taxable” status, as a percentage rate. 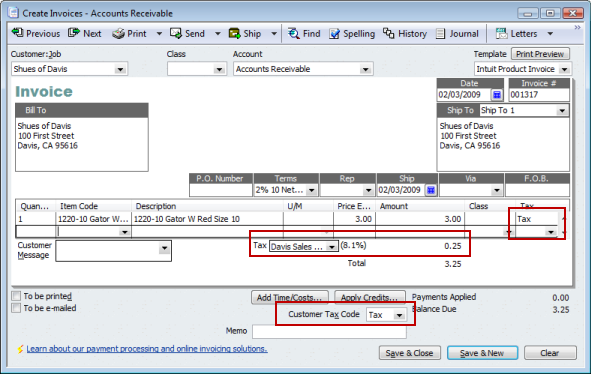 Then you either can create group items for lodging and meals, and include the “other charge” tax in the group, OR just add the other charge as a separate line after each item in the invoice, OR segregate your items in the invoice, add a subtotal, and add the other charge after the subtotal. The other charge items would be set up to post to current liability accounts for the individual taxes. Then you can look at the balance of the other liability account – that would be the amount you owe. The failing here is reporting – you don’t get a nice report that shows all the taxable charges. I don’t know if you have to report the detail, or what. But this might give you something to play with. The export process also creates tax agencies in the QB vendor table. I see that i can run an ITEM report for a specific item (sales tax item for example) to get total amts owed to a tax agency, but i do NOT see where i can associate an ITEM to a vendor. Can you comment on this setup? thanks. WestCoaster: You don’t mention what method you are using to import the data to QuickBooks. Most import methods have a specific way to handle sales tax, rather than using items in the body of the invoice. However, if you are going to use the approach you outline, your sales charges should be “sales tax” item types, and in that item type you can specify the tax agency. 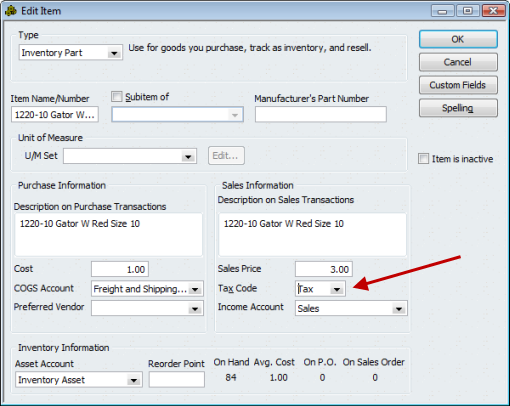 Note, however, that it is a bit tricky, due to the way that QuickBooks works with sales tax items embedded as a detail line. If we issue a credit to a customer, is it necessary to issue a separate credit memo, or can we just enter it directly in the invoice. It seems that this becomes a problem when it is a taxable customer. It messes with the Sales Tax Liability report, and creates a negative sales tax liability. We pay our sales tax on a cash basis, but it seems that every time we issue a credit on an invoice the credit part shows up in the ST Liability report immediately, even though we don’t owe the actual sales tax until we receive payment. I hope this makes sense! I think the problem comes in when we make a credit a taxable item. One of my clients was asking about this last week – this is a great summary, so I will forward the link to them. Thank you! Is it possible to pay foreign sales tax (ie GST in Canada) when the home currency is set up in USD? I have a RV Park that we charge a lodging tax on, but if the campers/RV stay for more than a 180 day then there is no lodging tax. Is there a way to setup QB so that isf a customer has been active for 180 days it will not tax them the lodging tax? Toby: There isn’t a way that I’m aware of to have QB automatically stop charging a tax once that occurs. You have to track it yourself, and change the customer status. I discovered an interesting problem when setting up sales tax groups using the Premier edition. After creating the sales tax groups for several of my clients the total percentage displays correctly on the terminal. After saving and exiting, then printing a report to review, the sales tax rates are not correct! Upon viewing them on the terminal, they each group no longer displays the correct figure. Thanks for checking back on this with me. 2009 Premier. I think the last update was R7 which was accomplished today. Even after the update today the sales tax groups were still rounding up and in decimal form. I went to the sales tax group, selected the first combination and tried to re apply the same configuration of tax agency combinations that were required using my drop down list. That did not work! I think the software saw it as identical data and did not trigger it to display differently. So, while in the same sales tax group, I selected a DIFFERENT item from the list that was really not ultimately part of that tax group combination and it toggled the display to change!! WOO HOO! I went back up and re-selected the PROPER item combination and it worked. I then did this for my all my combinations and it it appears to have solved the problem. This resolution was so convoluted. Hmmm, trying to describe how I got it to work is probably clear as mud. I hope it makes sense to you. It seems to have worked so far – I am still in the process of conversion. Hope this helps somone else that might have the same issue. In addition, I would like to establish a separate GL account for sales tax accrual specific to each state jurisdictions other than California – rather accumulate all sales tax liability in one bucket as it does now. Do you know how I can over-ride that? We work in several states and trying to reconcile ONE GL sales tax account for all might give me more gray hair. Now that the sales tax rates are increasing in CA, should I enter new tax items with the new rates or can I just edit the ones that I already have set up? Thanks for all of your insight and knowledge! Teri, that is an interesting question which is being discussed in the Intuit Community forums. The QB help file says to not change the existing rate – that you should add a new one, which implies going to each customer and changing the rate item. The help file says that the change will affect prior transactions and reports. I’ve not tried that myself, so I can’t say for sure at this time. A quick test in my system showed that changing the rate for an item did NOT affect existing transactions, and that would fit with my understanding of how transactions are handled. But I haven’t looked at the reports yet. So for now, I’d say go with the QB recommendation, make a new sales tax item. I work for a bar that already has set up the spreadsheet that you show. My question is, can you switch it around so you put in your total and the program takes the tax out? Right now the manager Z’s out the register, then has to manually take the tax out and input that number into quickbooks which automatically adds the tax back in. Laura: I’m not sure what “spreadhsheet” you are referring to. However, if you want QuickBooks to manage the sales tax liability report, then off the top of my head I’d say that you have to enter the figures the way that you are doing it now. I don’t know enough about your situation to say much more, as I don’t know how much of your register sales are taxable and how much aren’t, etc. Teri, you have to make a new sale tax rate. If you use change your just your rate it changes your Sale tax Liability reports. Is there a way for us to automatically seperate the sales tax portion of a payment for an invoice as the payment comes in? Right now we basically just put money aside and then quartely go in make a check. I would like for the sales tax to be seperated instead of recording the complete payment and have the register appear to have more money than it actually does because a portion of it has to go out for taxes. John: When you invoice, the sales tax is accrued to the tax liability account. The full amount of the invoice (including sales tax) goes to A/R, since is it an amount that is receivable to you. When you receive it, it’s cash that you are receiving and is in your bank account. I’m not sure what you mean by you’re “setting it aside” – if you mean you are pulling out that case from the bank account or what. In any case, if you look at your bank account and you look at your sales tax liability, you get an idea of what you have for cash that isn’t committed. So I guess the answer to your question is “no, there isn’t a way to have it automatically go to a different bank or cash account”, if I understand what you are asking for. Thanks and i apologize for the confusing question. You answered it perfectly. There is no way. Can you recommend some of the 3rd-party add-ons for looking up tax rate based on zip code? Tina: I’ve not worked with any at this time. The only one that I’ve seen is Avalara – the demo I watched was impressive, but I’ve not had my hands on it. The pricing structure is better for people doing a volume of invoices. I’m going to be working on a review of their product, hopefully in the next 3 or 4 weeks, so watch here for news on that. I AM TRYING TO FIND A REPORT THAT WILL SHOW ME THE SALES TAX GROUPS FIGURES, NOT BROKEN DOWN BY THE ITEMS. WHEN PAYING KANSAS TAX, THERE ARE 2 OR 3 ITEMS THAT MAKE UP THE GROUP. THE STATE, THE CITY AND THE COUNTY BUT THEY ALL ARE PAID TO THE SAME VENDOR, MY ISSUE IS THAT THE STATE OF KANSAS WANTS TO KNOW TAXABLE SALES BY TAX GROUP WHEN WE SUBMIT OUR RETURNS, HOWEVER, THERE IS NOT A REPORT OR A MODIFICATION TO AN EXISTING REPORT THAT I CAN FIND THAT WILL SHOW ME SALES TAXES BY GROUP. ANY SUGGESTIONS? Lisa, the Sales Tax Revenue Summary will show you the taxable sales by detail item, and then will give you a total for the taxing agency. The Sales Tax Liability report will do the same thing. Is there a way to keep old sales tax vendors from printing on the sales tax liability report? We used to do business in a bunch of states we no longer do business in and my report is cluttered with zeros. Both vendor and tax item are inactive but they refuse to go away! Thanks but that did not work either. I’ll keep trying new things and hopefully will stumble across the solution. Charlie – My daughter has recently become a Mary Kay consultant. Mary Kay charges the 6% State Sales tax to my daughter on her purchases. How can we charge her customers this sales tax item without having it listed in the sales tax liability account. Kathy, I’m not an accountant, so I’m not really qualified to deal with that. It is more of an accounting question – and the answer may also depend on the laws in your state as well. Are you reselling the item to the customer in a taxable situation? If so, you have to charge the customer for sales tax on the price you sell the item for, Then on your state report when you file your sales tax information you may have a place to report the tax that you were charged. However, again, that may differ from state to state, and I’m not qualified to give you a good answer on that. Devendersingh: I can’t answer that question as I don’t know what state you are referring to, and I’m not a CPA so I don’t usually answer that kind of detailed question. My question is about sales tax in QuickBooks Online Edition. 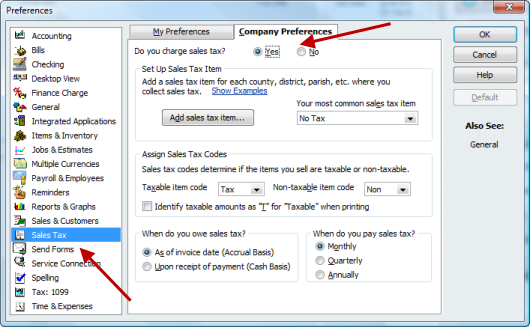 It appears that you cannot assign a sales tax rate to a customer, as you can in the desktop version; is this correct? We have a company that works in three adjacent states and it’s tedious and a source of error to have the person creating invoices have to keep track of what taxing agency and rate to use during invoice creation. Please let us know if you have any info on this. Thanks in advance. Theresa, unfortunately I can’t answer that, as I don’t work with the Online Edition. Too limited for what I ususally do. In the state of Georgia, we are required to report sales tax by county (to one sales tax authority). In addition to the 4% state tax, each county has as many as five additional types of taxes at the rate of 1% each (ie Local Option, Education, Homestead, etc.). For example, Coweta County has a 7% total sales tax, which has to be reported as State-4%; Local Option-1%; Special-1%, and Education-1%. Each of these must be itemized and calculated on the sales tax return for each county involved. (Isn’t sales tax reporting fun ha ha) I would like to be able to run a report so I can fill out my return easily. At this point I am figuring it manually. My point is, should I set up a separate sales tax item for each county and each type of tax for that county? Yikes! Karen, that is a similar situation to what we have in California. You may find that you want to create a sales tax item for each separate tax (the education, special, and so forth, as well as each county) to match your reporting requirements. 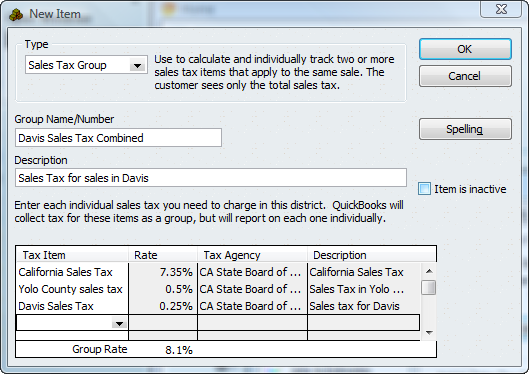 Then you need to make a sales tax group for each “nexus” – or combination. Perhaps one for each county. Where I am we have a spearate group for the county, and sometimes one for a city in the county if there is an additional city rate. I’ve seen some places where you have very complex overlapping districts (county, city, sports stadium districts) where you may have different combinations street by street. In complicated situations, where you are doing a high volume of invoices with many confusing districts, you might want to look into a product like Avalara, which will take care of the decisions on which tax to apply based on the street address, and that handles your reporting as well. I hope to do a review of that in the next month or so. Maria: You can only have one account for all of your sales tax payable, and you can’t get around that in QB itself. Send a note to them by using the Help/Feedback option in your program. The only way to deal with this is to either use a different kind of item (which causes lots of work and makes your Sales Tax Liability report worthless) or to use a third party add-on like Avalara tax (which has a cost associated). I keep on putting off writing a review of Avalara, I just have to get around to it. Charlie: we live in TX where you can remit sales tax either on accrual or cash basis. We have been remitting on an accrual-basis but want to switch as of now to cash-basis. I have essentially gotten AR down to zero and have entered no new invoices. I also made sure that vendors/pay sales tax with ‘tax due’ through end of June was $0. I switched the flag (manage sales tax/upon receipt) and looked at vendors/pay sales tax and suddenly I owe $8,000 in sales tax for June. Of course I received money in June, but have already paid all that sales tax earlier when the invoices were created in earlier months. Could it be that the flag is a global flag and doesn’t have any ability to say “from today onwards” ? Do you have any tips on how to change from paying sales tax on accrual basis to upon-receipt-of-cash basis ? Carolyn: I can’t give you a detailed answer as I don’t know all the details of your situation. The flags like you are talking about generally are not date sensitive, so it isn’t surprising that switching it created some added liabilities. Off the top of my head I would say that you have two general options: (1) create a new company file and transfer information to that, starting off with the flag set properly (this could be a lot of work), or (2) use the “adjust sales tax due” feature (Vendors/Sales Tax/Adjust Sales Tax Due) to make an adjustment of some sort to get rid of that liability. Without seeing your data I can’t say which would be the best approach. MAKE A BACKUP COPY of your file first before playing with these. I have the sales tax set up OK, but the Arizona reporting form instructions are set up as if the gross sales include the sales tax and you are to add the sales tax in with the non-taxable sales and deduct from all, but QB (Pro 2008) is calculating gross sales without the tax on the liablity report. If I use the QB figures on the report as is, the sales tax comes out the same, but when I fill in Schedule A putting in the non-taxable sales deduction and sales tax figures separately they total more than the total deductions (using QB figures). Can I get a liablity report from QB that shows the gross sales including tax? Debbie, I’m not sure I understand exactly what you are saying. The Sales Tax Liability report shows you non taxable sales, taxable sales and tax collected. It should be a simple matter of adding the appropriate columns to come up with the value that you want? You could also try exporting the report to Excel and having it do the addition of the columns. I was told to combine the sales tax as part of the invoice together with the price so at the end of the month I can use this one form for taxes. 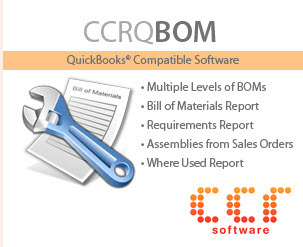 We are in construction contracting do I have to use the sales tax part of quick books? Gaby, I can’t tell you what your state requires you to do for sales taxes (I’m not a CPA, and I also don’t know what state you are in). If you are required to charge sales tax for what you do, then usually it is best to enable the sales tax feature so that you can get the reports. Your local tax accountant should be able to help you. I’m using quickbooks premier professional 2009 in the UK. We have a standard sales tax (VAT) rate of 15%, as well as a reduced rate of 5% for health-related products, like sanitary towels for example. If i sell multiple items to the same person, and some are full VAT whereas other items are reduced, how can i set up my quickbooks to work like that. At the moment it either charges everything at 15% or everything at 5%, as a result i can’t enter certain invoices, because the total and the sales tax chargeable are both wrong. Please help. Thanks. Shabaz. Shabaz, unfortunately I don’t work with the UK version, so I am not qualified to talk about that. This blog focuses on the US editions, which work very differently than what you are using. Hi! I’m new to QB Pro and have a sales tax question (or maybe two), please. Our Z-tape from our cash register breaks the types of sales down to the bare bones, such as recording a sales receipt for gifts not including the sales tax collected. It does reflect separate totals for taxable and non-taxable sales, and the amount of sales tax collected. When I record the individual sales receipts, the sales tax liability records correctly. However, shouldn’t I have a separate account set-up to record sales tax collected and enter that data as well? Otherwise, there’s no accounting reflected for having actually collected the sales tax and having it available to pay. IOW, if I don’t set-up a sales tax collected account, wouldn’t this cause an issue with reconciling our bank account that the tax payments will be paid out of? Sorry for the lengthly question, and thanks so much for your help! Linda, I’m not clear as to how you are entering your Z-tape info into QuickBooks. How are you entering the sales tax from the cash register? Thanks for your speedy response! My apologies for not being more clear. The Z-tape has each type of sale (i.e., floral, gifts, cards, etc.) listed individually + the amount of sales for each of those categories for the day. When entering the data in QB, I enter the sales amount for floral (total for the day), gifts, etc. without sales tax included in the amount. Have set sales tax preferences to calculate on the bottom of the sales receipt, thus giving me a running grand total of sales tax liability. Am getting ready to pay sales tax due for September, but got to thinking that although I know the amount due per QB (and it is correct), I haven’t entered the amounts I have actually collected through the register sales. The Z-tape tells me the amount of tax collected, but am concerned that since I haven’t entered the collected amount in QB somewhere, I will be shorting myself when I “pay” the taxes. I do know that sales tax collected is not to be included in income, but would believe it needs to be recorded in QB somewhere (and debited) as the taxes are paid. Not enough java this morning… Sorry I missed your point. I have not entered any sales tax collected from the Z-tape. Thanks for your response. Yes, everything you mentioned is exactly what I am seeing (and is correct). And, the correct sales tax “liability” amount has been calculated by QB as well. What I need to know is if I need to set-up a “tax collected” account as I am getting ready to pay/submit my sales tax to the state & city, but do not have the amount collected input anywhere in QB. So, if I just say “pay,” it appears the tax payments will be taken out of my bank account in QB without any acknowlegement of the taxes I have actually collected. IOW, as of right now QB has no idea that I have actually collected those taxes at the time of the sales. Do I add a tax collected account? If so, when I pay taxes, do I credit tax liability and debit tax collected (if I have everything set up correctly)? And would the tax collected account be an “other asset” since it isn’t income? Sorry for all of the confusion, I’m a real rookie here. And thanks again for your help! Linda, when you use a sales tax item in a sales receipt or invoice, the amount of sales tax it calculates is automatically put into your sales tax payable account, which is an “other liability” account. So if you are using sales receipts, and you enter $100 of sales that are taxable at 10% (for a total of $110), you are putting $100 into the sales accounts, $10 into the sales tax liability, and $110 into undeposited funds (if that is how your file is set up). So you can always look at the sales tax liability account to see the amount of sales tax that you have collected. Look for the two sales tax reports in your report menu under “vendors and payables” – the “sales tax liability” and “sales tax revenue summary” reports. Thanks, Charlie for your help! It all makes sense to me now. I’m having a problem with sales tax. I have a customer where there charge is $65.00 with a 5.5 state & 1.5 local sales tax. The tax should be $4.55 but Quickbooks enters it at $4.56. What do I do to correct the 1 cent extra so it doesn’t look like it is being owed by the customer? Brian, QuickBooks sometimes gets into rounding errors where it will be off by a penny. To be honest, I don’t know what the best way would be for you to adjust the invoice so that the customer doesn’t see that extra penny. The simplest is to just tell them that they don’t need to pay that penny, and then you would have to make adjustments on your side. I’ll ask a friend to chime in here if she has a better answer. Why do you say that the tax “should be $4.55”? Sometimes, this is an issue when the client manually calculates the sale and tells the customer one figure, but, then, when the system calculates it, there is a variance due to rounding. 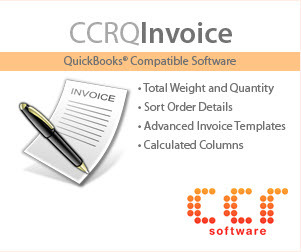 If the client wants to ‘give the customer a perfect invoice’, he should create the invoice in QuickBooks and hand it to him before (or during) processing of the payment. Otherwise, the client can add an item called Customer adjustments (or whatever) and add (+/-) that to the invoice to correct it to the manual amount. Another situation is when the sales tax group indicated 7%, so you would think that it would calculate the exact amount (as I suspect that Brian was talking about). My guess is that the clients know that their taxes are made up of two different calculations, so I would think that a mere “That’s the way the system works” should suffice. If your sales tax group has payments to separate tax collecting agencies, you wouldn’t be able to split that penny. . .
Bottom line – it isn’t enough to worry about. The tax agency, auditor, nor your accountant will take issue with minor adjustments in QuickBooks. 65.00 x 7% = 4.55. My client is the one that pointed the difference out to me. I can’t always do a pre-figured quickbboks charge as we may add extra service at the account. Another option would be to setup only one item – for the full 7%, but break out the 1% on the remittance, if they are sent to separate agencies. If not, just use the one item and, if necessary, break out the 1% on your report. Laura, I like that option better IF your state reporting will support that. In a place like California where we have many overlapping jurisdictions this might make the reporting less convenient, but in many situations it might be suitable. 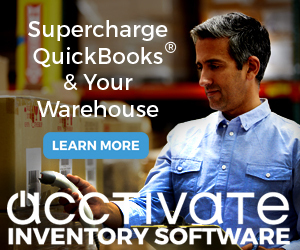 Do you know list of California sales tax rates that can be imported directly into QuickBooks? I’ve tried to make my own but am not having much luck. Sorry, Diane , I don’t know of a list like that. The rates aren’t that tough, the real problem is the groups. The taxation and revenue dept issued us a credit for overpayment from last year. They agreed to apply it to future months, but how do I show the credit when I go to pay the sales tax in QB? Try creating a journal entry. _Debit Sales Tax Payable with the sales tax vendor name attached. _Credit “Other Income” with a note in the memo field. Then, when you go to pay the sales tax, put the amount paid (+) and the amount credited (-), giving you an adjusted check. Folks, Laura has a web site at http://www.centsablebookkeeping.com/ and I highly recommend her if you need help with bookkeeping services and QuickBooks. Thank you so much Laura! It worked like a charm! As we used sales tax at footer of invoice can we use discount in footer. Zulfi, there isn’t a “discount” that can be put in the footer, regardless of what you use for the sales tax. What are you trying to accomplish? I just spoke to QB’s and they informed me that my sales tax liability report is not working on my mac because I have more than 25 sales tax items (I’m in CA, so that is easy to do without traveling more than 3 cities away). (Knowledge-base ref #1011577) They said I could create a custom transaction detail report, but that only seems to work for one item at a time, resulting in 50 pages of report per month for 50 sales tax items. Does this make sense to you? Laura, I hadn’t seen that notice, but I don’t work with the Mac version. The report gives you a lot of detail – you might print it to a PDF or export it to Excel rather than waste a lot of paper. I’ve seen that kind of recommendation recently in some Windows version errors related to sales tax that came up last month. I can’t say if that will give you the perfect figures. In my test file, I can see that the two reports have similar values, BUT that transaction report won’t exactly match ALL of the information that you get from the sales tax liability report. It shows the taxable transaction, but not necessarily your liability if you have unpaid liabilities from before (unlikely? not sure). But, if you are careful how you generate the report, and you have been keeping your payments up to date, it should work. What is the process for paying regular federal and state company income taxes, i.e. what category does the IRS fall under? Should it be not be a vendor since there is no category for this (since it doesn’t seem it should be a tax agency since it is not related to sales tax). If it is not a vendor do you not enter it as a bill and just write a check? Connie, I’m not a CPA, so I’m not qualified to give you an “officia” response. However, you can create either a vendor or an “other name” entry for the IRS and then write a check to them. If you want to keep your “vendors” just being people you actually buy things from, the “other name” list would work perfectly fine. Thanks a lot for this info. The layout was very easy to follow. Being able to do this made my day. Thank you for this great reference. Your instructions and photos were easy to follow. Hi, I very rarely charge sales tax – in fact only two transactions this year. Currently, I have the check I wrote to the Revenue Department under Sales Tax Paid as an Other Current Liability. Is this the correct way to allocate this transaction? I really appreciate your input! Kim, if you are using sales tax properly, you don’t want to create your own check manually. You want to select “Vendors” then “Sales Tax” then “Pay Sales Tax”. This will create a special type of check, a “Sales Tax Check”, which will post against the Sales Tax Payable account automatically. If you manually create your own check to pay this liability then all of your sales tax liability reports won’t show the information correctly. Does QB Online have a multiple sales tax feature? Sorry, Shauna, I only deal with the desktop version. You might try asking in the Intuit Community Forums. Using QBPremier Accountant Ed. 2008. I’ve got the need for group tax and have it set up properly. Unfortunately, I’ve found a problem, perhaps you have an idea. Each of our invoices uses one Class per invoice, never multiple classes. One of the taxes we pay, has to be paid individually by class (which represents a unit rental tax). When I use the group tax option, the classes are not being registered. So there are no reports that I can create to show that the tax collected per unit is accurate to the tax due. Two solutions I have available is to simply run separate rent income reports by unit/class then calculate the tax on each and see that they add up and are disbursed, though the Pay Sales Tax option would be out, since it pays in a lump sum. The other is to do line item taxes for each tax, avoiding the group tax option at the bottom of the invoice. Still can’t use the Pay Sales Tax option, but at least the report would be quick and accurate. I suppose with either way, the Pay Sales Tax could be used with the adjustment aspect, simply using the reports to pay only portions through editing the “to be printed” checks before they go out for memo and amount, rinse and repeat till each unit is accommodated. Any ideas? Is the Group Tax and Class, just not set up to love each other? JL, I’m not sure if I understand all the details, and that is a bit more than can be worked with in comments in a blog like this. That tax is different than a sales tax – so I would consider setting up an “other charge” item perhaps, as a percentage, and have the amounts posted to a separate account. You don’t get the benefits of the sales tax features, but it might resolve other problems. Hard to say, as I don’t know all the details of your situation. In the “Pay Sales Tax” dialog box, I can adjust by “reduce sales tax” option and input the amount for one unit, in this window I do get a class option which shows up in a report which the boss needs. In “adjustment account”, I chose Accounts Payable and it defaulted to the Tax Collector. So now sitting in Accounts Payable is an entry for that specific amount. Furthermore, when I re-open “Pay Sales Tax” and change the month to a previous month (I don’t understand why it isn’t in the current month, but it isn’t.) There is the option to pay that tax as I “adjusted” it. However, only one can be done at a time, then it has to be paid, or the next one simply accumulates and I’m back to the same ol’. It’s an option, and it keeps it all in the sales tax realm which keeps the tax tagged to one vendor. We have to pay a rental tax to a local association based on a percentage of the rental price, just like sales tax. We also have a standard state sales tax and a hotel/lodging type state sales tax. The state taxes are no real issue, we take responsibility for that. But that local tax has wording that makes the homeowner responsible, so our property owners (we are the management/marketing company for them) want to see that we have paid each of their taxes each month, not a report, and actual copy of the check. So we have to make many smaller payments in order to assure they can each see their rental property, without seeing anyone else’s property details. If we sent one check, the related tax collector would insist that it define each property that is being paid for, so that type of check would be too much information to share with one property owner. Each unit is a Class and therefore being able to report and write checks by class within the sales tax system would be a huge help. Unfortunately the Group tax option doesn’t retain the Class, line item taxes do though so I can just use it that way. After trying the above check writing solution, it didn’t work. When I went to pay just the amount I had adjusted, I got a dialog box stating that there was enough money in the sales tax payable account to pay that amount of tax and no check would be written, and it rolled it back into the sales tax payable. Yeah, I could use an other charge item, but then I lose a lot of convenience regarding the sales tax system, like having the amount go straight into Accounts Payable. All other items besides sales tax refuses any attempt to choose accounts A/R, A/P, Undeposited funds, and others. Oh, well, I’ve found ways to tweak QB many times to do things most say aren’t possible. I’ll keep bashing at it, I’ll add more comments if I find a smooth option that uses existing systems rather than resorting the GJ entries, which just make most bosses uncomfortable,…stupid I know, but still, the terms “adjusting” and “journal entry” seem to cause angst amongst non-accounting, small office, construction/manufacturing bosses/clients I’ve dealt with over the years. If they can see things handled through Invoices, Checks, Bills, etc, they feel so much better. Good blog btw. I’ve bookmarked it to return often. Another Great post, I will save this in my Furl account. Have a good evening. Okay, I have it solved. It’s surely unglamorous to be sure, but it’s solved. Before the solution, a note about an important aspect. Go to Edit>Preferences>Checking and unclick “Print account names on voucher”. This is an integral part of the fix. Now, you’ll need to set up multiple vendors, all with the same Tax Collector information but different account names relative to the units, be sure to fill in the “Print on check as” box in the lower right corner with the actual Tax Collector’s name. So we now have vendors named “XYZ Tax for UnitA1”, “XYZ Tax for UnitB21”, “XYZ Tax for UnitC33”, etc. Next set up Sales Tax Items relative to each vendor and hence each unit…here I put the unit first for faster type and fill properties of line items while Invoicing. Like this… “C33-XYZTax”. Then associate the correct vendor to each. Now the Sales Tax Payable system will allow me to choose all the units’ taxes at one time with select all, and still have individual checks for the Tax Collector, copies for the related owner without disclosing other owners’ data, and a very detailed tax report for the boss. Since there are so many units, I used EXCEL to IFF imports for both the new vendors and the new sales tax items. Okay, hope that helps anyone who cares. I still wish the Group Tax would work and I’d kill to have the Sales Tax System work with sub accounts instead of lumping all Sales Tax Payable in one Balance sheet line item, but hey, at least the working parts work now. BTW, it’s after 2am here. Upon re-reading my last post, I see that my wording is a bit off. I’m sorry. I’ve been bashing at this every waking moment since last Wednesday. Between the lack of sleep and the excitement at finding a solution, I didn’t write nor proof-read well. Has anybody given this suggestion on setting up GST in the US version of QB a try? We would like to stop paying for the Canadian version of QB in addition to our QB Enterprise US license. We are hoping we might be able to set up one company and designate it CA$ and tweak the sales tax to duplicate GST needs. Help. I corrected improperly paid sales tax in a customer’s account by deleting all payments made through “pay bills” and repaying them through Vendors , Sales Tax, Pay Sales Tax. The problem is my Vendor (“State Board of Equalization” ) account shows a higher balance ($1140.00)owing than what is currently owing. Yet when I go do a sales tax liability report or go to the Pay sales tax window the amount due to date is correct $804.00 . I can not understand why the Vendor does not show that same amount $804.00. I hope you can help me resolve this. Thank you! Denice, given that you have been making corrections and deleting records, I would suggest that you contact a QuickBooks ProAdvisor or Sleeter Group Consultant in your area who can look at your file. There are a number of possibilities. Hard to give you an answer without seeing the file. I have a client from India. How do we configure GST in QuickBooks Desktop Pro 2017. Please advise Charlie. I’m not at a place where I can test QB at this moment, so I can’t give you a definitive answer. Here is something to test, if you can make a backup copy of your file and then restore it to a “test company” to play with. Or make the backup, test in the real file, then restore the backup. But be careful with that. You have different sales tax items for each jurisdiction – what if you have just one tax entity that they all work with? It might work, it might not. Thanks for your reply. I have played around and tried a number of things but I can’t find a way to make it work. Here’s an example. For a show in Leander, Texas the taxing entities are: State of Texas (6.25%), Leander City (1%), Austin MTA (1%). I have each of these set up as a Sales Tax Item. I then create a Sales Tax Group based on the show’s exact location containing those three entities..In this case its called “Leander Show” and that is used as the tax code on the Sales Receipts. When I run the Sales Tax Liability Report, I get the needed breakdown of the sales and tax due to each of the taxing entities which I must have to complete the state filing. When I actually file I have to send one check for the total amount to the State of Texas with the filing. When I run Pay Sales Tax in QB, it creates a separate check for each taxing entity. In the example above, it creates three checks. I tried putting the total amount in one check in QB and deleting the others, but that screws up the Tax Liability report report because it only credits the Taxing Entity that is the payee of that check.